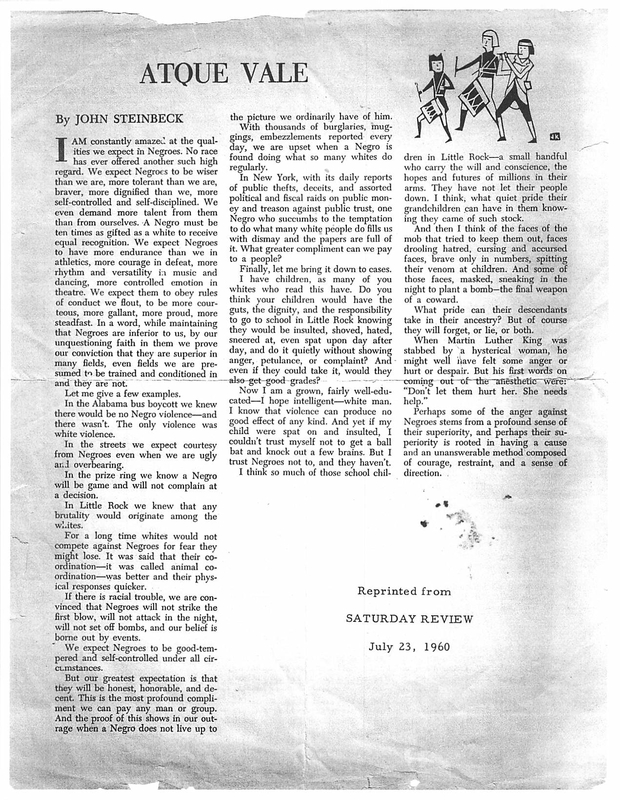 Here is an interesting essay by John Steinbeck that my Dad found among my grandmother’s old photos… What are your thoughts? This entry was posted in Uncategorized and tagged African Americans, Civil Rights, Prejudice, Race, Race Relations. Bookmark the permalink. thank you for posting this. it gives great insight into one of the most recognized writers of American literature. it also gave some clarity and understanding. many assume that most whites were against equality. however this just proves the alternative minds around who thought differently. This is some good information that our black children need to read and study throughout the U.S.A. and beyond. I totally agree. We need a total overhaul of what is presented as “Black History” to include so much more than our children (and college-age students) are currently exposed to.